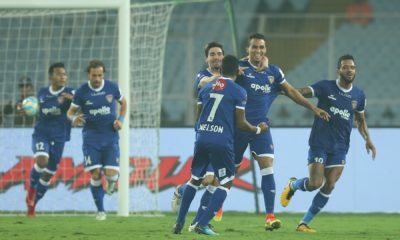 Chennai City FC put in a spirited performance to hold defending champions Bengaluru FC to a 1-1 draw at the Jawaharlal Nehru Stadium. Bengaluru will be disappointed with only the 1 point considering the balance of play. 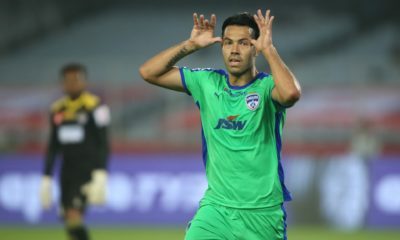 Bengaluru FC went into the game as favorites despite a recent slump in form. The defending champions, however, were not clinical enough when it came to finishing the chances created. BFC dominated possession for most of the game but never really looked like scoring. The lack of end product in the final third is also something that coach Albert Roca should take note of. 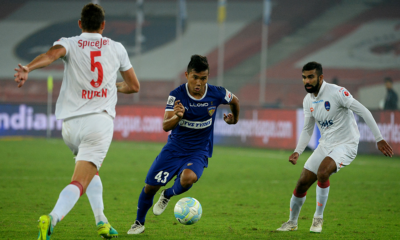 The BFC wide-men were pacey and able to beat their markers but did not really put in dangerous crosses for the likes of Sunil Chhetri to take advantage of. Even the introduction of CK Vineeth and Eugeneson Lyngdoh didn’t really galvanize the BFC side to be able to find a winner. As recent entrants to the I-League, Chennai City FC have built a more than capable squad in limited time and with limited resources available. Coach V. Soundararajan has also settled on 8 to 9 players he definitely favors to play most games which bodes well for the stability around the club. The CCFC coach has also brought in a balance of experience and youth that is keeping the team in shape. Nandhakumar, the young winger from the local Tamil Nadu league has really stood out in recent weeks. His pace on the wings as well as exquisite crossing and set piece delivery have made the U-22 player a fixture on the right wing. Incidentally, a Nandhakumar cross was what forced Bengaluru defender Johnson into an own goal, heading into his own net. Another young player Soundararajan has faith in is 22 year old defensive midfielder Dhanapal Ganesh. The tall midfield destroyer has started all but one game for CCFC, being paired with a variety of players in the middle of the park. His tackling and power are extremely important in shielding the back-4. Ganesh has also been selected for the upcoming World Cup Qualifiers which shows the ability he possesses. The Chennai team also has players like Karanjit Singh, Debabrata Roy and Dharmaraj Ravanan, the kind of whom have been around the India footballing scene for a while now. 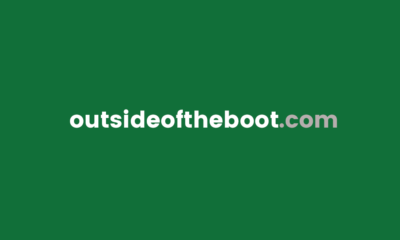 This ensures that the air of uncertainty around a new team is significantly reduced and ensures that the coach has experienced heads to rely on. Chennai City have unfortunately not been able to take 3 points from a lot of winnable games this season and instead have drawn. While they are exempt from relegation, the new entrants need to cultivate a winning mentality and start picking up points more regularly. The quality of football in the Hero I-League has been vastly different over the past few matchdays as compared to the initial few. The hunger shown by teams as well as the motivation of players and coaches have made this I-League campaign a much improved affair. Bengaluru who put up a marvelous show to clinch the I-League title last season and make the AFC Cup final have had struggles of their own this season. I-League giants Mohun Bagan and East Bengal looked invincible for a period of time but now find themselves 2nd and 3rd respectively. Aizawl, who no one predicted a title challenge from, are deservedly on top of the pile. This genuinely does indicate that Indian football is on the rise. As DSK Shivajians coach, Dave Rogers also enthusiastically mentioned in a press conference, “Indian football is the winner” when so many young Indian stars are given a run-out with first teams.